is how fast I ran on the treadmill tonight. When I listen to it, my pace is slow and then builds up. I’d eventually like to be able to run for the duration of the entire song. I got halfway through my playlist, about a mile in, and then I quit. I rode the bike for the next 30 minutes of my workout. I would have run more had I not been exhausted. I have been mentally and physically tired as of late: work stress, life stress, lifestyle stress…so much stress from most all sides, and I feel like I’m not handling it very well. Like I could be handling it better, but it’s nagging at me. It’s affecting my sleep, and I’m having to take something every night just to get myself to sleep at all. I hate it. I really, really do. I wish I could turn my brain off at night so that I could sleep more than 6 hours each night, but it’s impossible. I lay down, and my mind races thinking of all the things I didn’t get done during the day. I hate that I can’t quiet my brain when it’s time for bed. And I really hate having to get up early every day–early being around 6:15-6:30 am. I am simply not built for morning! I’ll try a run again on Thursday, when I’ll actually have an extra opportunity to work out since our support group meeting has been cancelled for this week as Dr. A is going to be out of town. Friday night, my husband and I are planning to go pet some puppies at a local pet store, have dinner and then go to the gym for our usual Friday night gym date. I wish it were going to be warmer and dry out this week, because I’d like to give running outside a try. It’s a very different experience on a treadmill, and I somehow don’t think that I will be able to run at the same speed outside as I do on the treadmill since the machine is forcing me to run at the speed I set it at. I guess I will wait until it is warmer out and then give it a try at the park nearby. I’m just nervous about looking like a total amateur, but I guess even the most elite runners had to start somehow, somewhere, right? And this weekend, I’ll try to sneak in some more sleep. This is one of the last weekends for a while where I don’t have to be somewhere early, so I’m going to take advantage of that fact and sleep in until around 9. I slipped up today foodwise. I ate a cookie. UGH. Today was a heavier carb day than usual because I knew I was going to the gym this evening, but a cookie??? WTF, self? And it wasn’t even good. I’m hoping it will put me off eating another one for a long, long time. Anyway, I ended the day with 103 grams protein, 49 grams carbs and 59 grams fat (boo). Calories eaten were 1098, so a good bit higher than usual. Tomorrow I’ll be closer to my usual 900 calories, as I’m planning on packing a mini meatloaf for lunch, strawberries and turkey breast as a snack. Breakfast is going to be a couple of honey soy chili marinated boneless skinless chicken thighs I baked last night. Not sure what dinner plans we’ll have, but I will be sure to choose something packed with protein along with some non-starchy veggies. 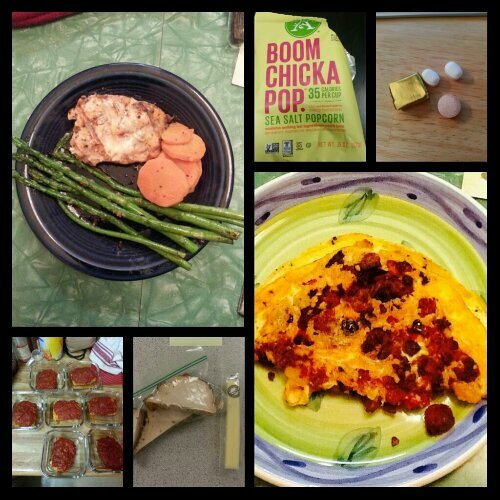 Today’s food choices, from upper right: multivitamin and calcium supplements x2, iron supplement; one-egg omelet with cheese, bacon and leftover hash browns; roast turkey and Trader Joe’s Monterey Jack cheese stick; mini chicken Italian meatloaf; leftover grilled salmon, sauteed asparagus and steamed carrots; single serving of Boom Chicka Pop popcorn. Not shown: chocolate chip cookie, sample of froyo. This entry was posted in celebrations, challenges, daily bites, eating, exercise, la guerra, NSV's, oh behave!, post-op, the sleeve, vsg, weight loss surgery, werk! and tagged aspiring runner, celebrations, challenges, choices, daily bites, eating, exercise, I am NOT perfect, I work out, la guerra, oh behave!, post-op eating, post-op life, runner wannabe, running, sleep, stress, VSG, vsg realness, werk!, WLS, workin' on my fitness. Bookmark the permalink.